The colors this time of year is why I love it so much. Yes, I love college football and the smell of hickory smoke in the firepit. But the colors are what make me smile. The rain that swept through earlier in the week left the sky as clean as a new window. When you have a sky this blue, almost any color pops. I shot the picture below on Thursday when I took the sumac picture. 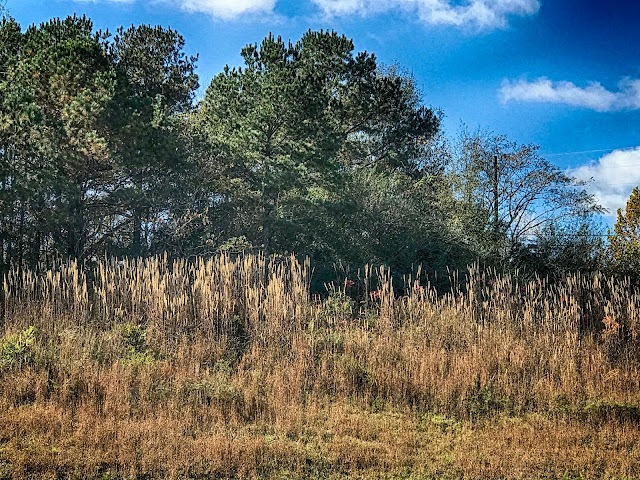 As I headed back to the truck, I shot this autumn grass on the other side of the Interstate. We have a gig this week and our practice sessions have been intense. I'm spent. I hope it's been a remarkable day where you live. That blue sky is enchanting ! Cloudy with a chance of flurries here this morning ! Very nice Rick, that sky is beautiful, a good rain always brings a clean view of the world. It looks like you used some kind of filter with this photo but it's still pretty. I would be interested in seeing the same photo side by side without the filter just to see the difference. When you've lived 83 years, every day is remarkable!! Great shot of the autumn grain. Good luck on the gig! I love your zest for life. Your enthusiasm for music and the land is palpable.